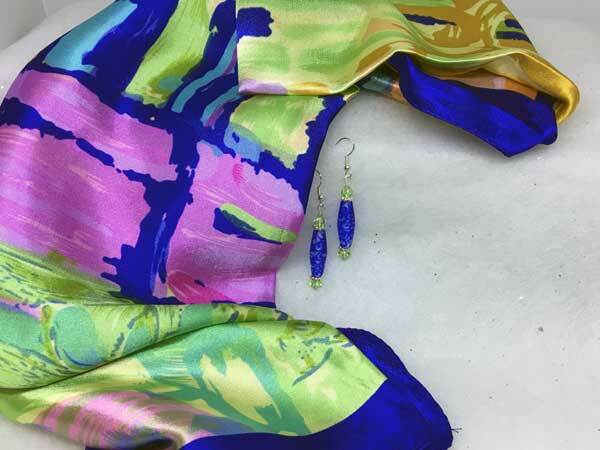 This vibrant, 100% silk scarf is loaded with color and pattern. It measures 34 inches square, for lots of styling options! This one has a royal blue border and the beautiful array of colors include: greens, blues, golds, pink and lilac and peach. The earrings hang just under 2" from the finding loop and consists of beautiful glass tubes in royal blue swirls surrounded by silver spacers and mint green crystals on either side.